Daley Financial Partners combines the personal dedication you look for in a financial firm with the depth of services and capabilities needed to help you meet your goals. Through understanding your priorities and helping you discover and establish your financial goals, we can help you create long-term plans that will address your financial needs. Protecting your business and your employees involves important considerations and a breadth of solutions. We understand the nuances of options business owners can choose from and can help you plan the right strategy to align with your priorities. This includes investment vehicles for employees, such as Simple IRAs and profit sharing as well as planning for executive retirement and succession. We have considerable experience navigating the opportunities and obstacles educators face when planning for retirement. We work with both current and retired teachers and are up-to-date on political and pension challenges that can impact planning and disbursement. We also handle relationships between districts and third party administrators. Women and money can be a powerful combination in our families, society and world. With a shared perspective on what it’s like to be a female investor and the complexities we all encounter, Daley Financial Partners is uniquely suited to work with you. Taking into consideration your personal and professional goals and circumstances, we help you plan a portfolio that addresses your individual objectives. 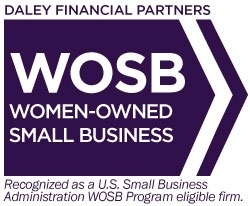 Daley Financial Partners is proud to be a Certified Woman-Owned Small Business.